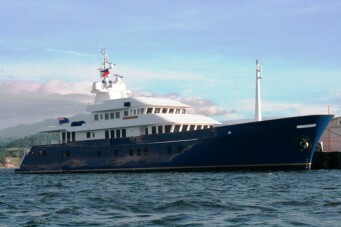 Northern Sun has been transformed from a fisheries research vessel into a luxurious long range expedition yacht. She was taken back to bare steel inside and out and completely rebuilt with new lagging, wiring, plumbing, electronics, generators, air condition, cabinetry, furnishings, bathrooms, galley, cranes, tenders, teak decks, fully faired and painted in Awlgrip. Her teak laid Sun Deck is completely private above the Bridge. It boasts a 4 man Spa Pool, an abundance of sun lounging areas, a bar fridge, ice maker and sink and her deck furniture stores neatly inside the funnel at the rear of the deck. Easy stairs on the port side lead down to the Bridge Deck which has a beautiful wide Portuguese style teak deck passing in front of the bridge and leading aft port side and stbd to the Boat/Heli Deck aft. Access to the Bridge is from port and stbd wing doors or from an internal corridor. The navigation equipment has been sensibly thought out and positioned by her very experienced captain. bench seat on port side with small coffee table allows guests and owner to enjoy the view whilst cruising. There is a chart table with drawers on port side and a good sized worktop on the stbd side. As well as the latest navigation equipment, there is also a flag locker with full set of signal flags. A Waeco drinks fridge is neatly located on the stbd aft wall. Leading aft from the Bridge on the stbd side, the corridor takes you first to a fully equipped Radio Room and then to a generously sized Captain’s Cabin, equipped with television, telephone, drinks fridge and Ensuite Bathroom. The Corridor then leads further aft to stairs down to the Main Deck. At the top of the stairs is a fire control panel, a locker with remote fuel shut off pulls and cables, a PABX telephone control box and the Nera Fleet 77 control box. At the bottom of the stairs is a Pantry giving a three-way access to the stbd Side Deck, inboard to the Crew Stairway or aft into the Salon. The Pantry has a U-Line ice maker, American Home fridge, hand basin and lockers. Back on deck, teak decks lead in front of the Salon and aft on port side and stbd. At mid ships are two reception doors to the Salon with well located side boarding ladders mounted flush into the bulwarks. Fire hydrants and life rings are nicely recessed into the bulwarks and superstructure and there is a hot and cold shower on the stbd side to rinse off after a swim. Moving forward on the stbd side, you enter the full-beam, very impressive Owners Cabin with king sized bed, sofa and separate vanity unit. There are plenty of hanging lockers, a safe, flat screen television and Bose Surround speaker system. The Ensuite Bathroom is huge, boasting a two person Spa Pool and separate shower. From the Dining Room, a door leads into a Pantry and further aft into the Galley. The Pantry has a Fisher & Paykel fridge, U-Line ice maker, Barrique wine fridge, Miele dishwasher and sink. The Galley is well equipped with Miele oven, microwave, plate warmer, 2 Viking 4-ring hobs and 2 Viking ovens, an industrial extractor fan, a Sub Zero fridge freezer and double sink unit. There is also a large walk-in fridge and freezer outside the Galley in the Crew Corridor. Locker forward. The Crew Mess is well equipped with large table, Sharp TV, DVD player, Digital Multiplex recorder, Fisher & Paykel fridge, Whirlpool microwave, U-Line ice maker, Miele dishwasher, Furuno VHF, and camera monitor for the 4 security cameras. Crew Cabins are well appointed with ensuite bathrooms per the layout plan. The Laundry is aft of the Crew Mess and equipped with 3 Miele WT104 washers, 3 Miele T422C dryers, a Miele D815D roller ironing press and plenty of storage for linen. Access to the stabilizer fin and hydraulic pack and frequency converter is from the Laundry. The Engine Room is in superb condition. The equipment has either been overhauled or renewed. New equipment includes: 2 Sea Recovery water makers (6 tonnes per day each), 6 Cruisair airconditioning compressors with Smart random selector on demand, Head Hunter toilet system, 2 x 170KW Tritex generator, on demand fresh water pumps, air compressor for engine starting system. The work shop has a lathe, bench drill, grinder, work bench and vice, 2 hot water tanks, plenty of tools and is air-conditioned. The entire area is a show piece. Northern Sun is ready for a New Owner to take her over, add their personal touches provision the yacht and go worldwide cruising. She is a very stable lady with long range capabilities. At USD15,000,000, she represents excellent value for money. Launched March 1976, First registered 3rd July 1976. Max. - 13 knots / Economic Cruising - 10.5 knots. RANGE (Based previous operational experience) 8,000 n.miles approx. @ cruising spd. 10.5 knots. Last major overhaul (under JG supervision) – 2003. Running hours – 62,000 hours approx. shields. (new 2007); port 744 hrs, stbd 540 hrs. 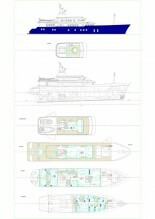 : Inventory of paper charts and nautical publications. : Fire hoses, nozzles, etc..